The roasted jalapeno adds smokiness and heat to this easy guacamole recipe. This Easy Guacamole recipe is incredibly tasty and has the perfect amount of acidity and heat. What makes it so special is the smokiness of the charred jalapeno. This technique transforms good guacamole into a stratospherically divine dip that can be eaten on its own by the spoonful. 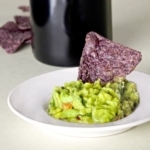 I usually make doubles of this easy guacamole recipe because my husband scarfs down a bowl of it as soon as I am done mashing and stirring! I must admit that I am also guilty of dipping my fingers into the bowl as I am making the guacamole and doing an unreasonable amount of taste tests. Nothing beats freshly made guacamole! I used to buy pre-made guacamole because I didn’t think I could create one as delicious as what I found in good Mexican restaurants. But after reading and familiarizing myself a little with Mexican food and its ingredients, I realized it didn’t have to be complicated! An easy guacamole recipe is 10 times better than pre-made guacamole and just as delicious as what they prepare in front of you when you are eating out. Serve this easy guacamole recipe with freshly baked tortillas, next to a summer rainbow salad or some sweet corn with creamy miso sauce. This Easy Guacamole is creamy, spicy and so refreshing! Make this easy guacamole recipe in less than 20 minutes from start to finish! In a small pan over high heat, cook the jalapeno until it’s blistered and charred (or do the same on a barbecue). Turn off the heat and let it cool to room temperature. Meanwhile put the avocadoes in a large bowl and mash them with a fork until creamy. Add the shallot or onion, tomato, and cilantro, and mix well with a spoon. Little by little add salt and lime juice until you are satisfied with the taste. Chop the jalapeno into small pieces and add to the guacamole. Mix well and serve with tortilla chips.